- Craniopagus parasiticus is a general term for a parasitic head attached to the head of a more fully developed fetus or infant. - Fetus in fetu sometimes is interpreted as a special case of parasitic twin, but may be a distinct entity. - The Twin reversed arterial perfusion, or TRAP sequence, results in an acardiac twin, a parasitic twin that fails to develop a head, arms and a heart. 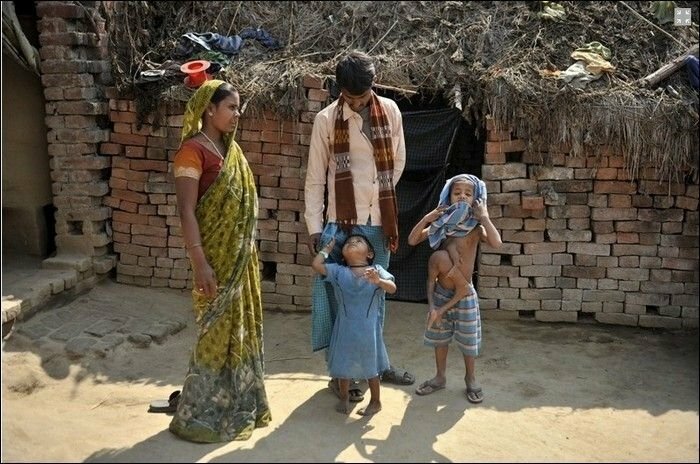 The parasitic twin, little more than a torso with or without legs, receives its blood supply from the host twin by means of an umbilical cord-like structure, much like a fetus in fetu, except the acardiac twin is outside the host twin's body. Because it is pumping blood for both itself and its acardiac twin, this causes extreme stress on the normal fetus's heart. This twinning condition usually occurs very early in pregnancy. A rare variant of the acardiac fetus is the acardius acormus where the head is well-developed but the heart and the rest of the body are rudimentary. While it is thought that the classical TRAP/Acardius sequence is due to a retrograde flow from the umbilical arteries of the pump twin to the iliac arteries of the acardiac twin resulting in preferential caudal perfusion, acardius acormus is thought to be a result of an early embryopathy.